Gluten-free friends and celiac countrymen, lend us your ears! It’s hot as can be outside and all we can dream of is enjoying a few chilled refreshments with some of our favorites. Won’t you join us? This post is all about sweet, savory, frozen, fresh and (yes) tipsy treats that are simple enough to enjoy on a regular weekday, and revitalizing enough to be your new go-to. When even basic vanilla ice cream can’t be counted on to be gluten-free, it can be tough to navigate the hidden dangers in your favorite warm weather treats – not to mention sugar, dairy, soy and all the other potential pitfalls of store bought fare. So… why not make ‘em yourself? We’ll start with the aforementioned classic: ice cream. Have you noticed gluten shows up in the weirdest places? Us too. But luckily – contrary to popular belief – you don’t actually need 3 pieces of machinery and the entire Seattle Men’s Chorus to help you make it au naturel, from scratch. In fact, you need just one tool: this blissfully simple gadget from kitchen company Chef’n. The Sweet Spot is exactly what it looks like – a pan that you chill in the freezer. Once it’s fully frozen, you pour in your concoction (it comes with a handy recipe book) and stir. Ta-da! The ice cream simply appears. Should you feel up to testing your chops, you can step up the mixtures to include some of these 54 creative flavors from Southern Living (you’re gonna want to try Peach & Toasted Pecan). Now, imagine you want to take it even further. Crazy right? You remember those classic ice cream sandwiches of your youth – rectangular and unforgettable – don’t you? The same company that makes The Sweet Spot also produces a simple all-in-one tool for putting those sweet summer camp mainstays together. It’s just what you need for filling with this gluten-free chocolate wafer cookie batter from Gluten-Free On A Shoestring. Of course, when all is said and done, there are some days when you just need to cut to the chase. For those moments of necessity, peruse this up-to-date list of Gluten-Free Ice Creams for your safest store-bought options. If your tastes run toward non-dairy, we understand. Can you even top treats made with the fruits of the season anyway? Williams-Sonoma has a simple 6-step tutorial for making granitas – basically a fancy sno-cone – of whatever variety you crave: like Earl Grey & Tangerine! 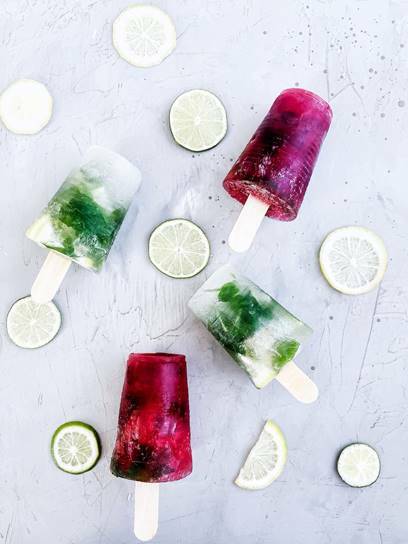 You can also lean harder into the fruit with a more smoothie-like concoction, like this frozen, non-alcoholic Blueberry “Mojito.” And of course, would any round-up be complete without popsicles? Certainly not without these Green Tea, Basil & Meyer Lemon pops. Now, hypothetically, let’s say you want something a little stronger. Imagine yourself in a beautiful English garden, but with booze, and you have these delightful Pimm’s Cup Popsicles, infused with fresh strawberries, cucumber and ginger beer. Or, got all-in on a pitcher of wine slushy! Vino you want to. The Kitchn put together a list of 15 creative recipes to choose from, like Rosé, Elderflower and Rose Lemonade. And finally – finally – we conclude with what those sans sweet tooth (yes, they’re real!) have been waiting for: 10 cold, patio-friendly summer soups. Savory (and a few vegan) options include avocado + cucumber, apricot + peach, and white bean gazpacho. Need we say more?